The world cannot be captured and ruled without religion. The elites at the top of the pyramid have always known this. In ancient Sumer, the early architectural form of pyramid was known by the later Akkadian term as ziqqurratu. 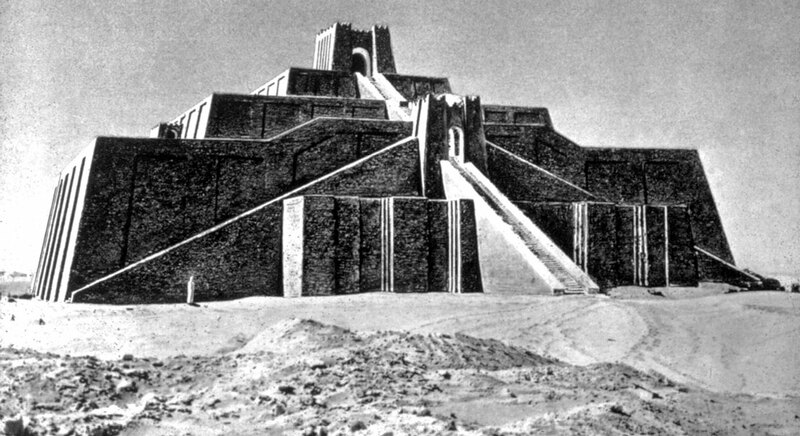 The original ziggurats indigenous to the lower Mesopotamian region were multi-tiered rising step structures consisting of successive increasingly smaller stages. The overall pyramidal form reached its zenith with a small temple enclosure at the very top. It was in this temple where the priests communed with the gods and received instructions for the people. No one was allowed at the top except the very highest of the priesthood. Such a structure was perfect for controlling a society. Each major city had its own temple complex. There was great pomp and religious pageantry associated with these ancient temples. The priesthood was either faking everyone out, knowing they were mere men engaging in a deceptive religious stage play, or was actually being dictated to by demonic forces. In reality, it was a combination of the two in that demons merged with humans. In their human nature, the pagan priests knew they were deceiving the public by presenting something inwardly contrary to the outward display. They had a secret, hidden agenda. Those lower in the religious hierarchy generally believed in the myth and were transfixed and ruled by it. They dedicated their lives to religious service thinking it was the highest of callings. As they climbed in stature and esoteric knowledge, however, some began to perceive that what they had been taught did not match up with reality. Their indoctrination was merely a façade. They had been deceived as had everyone else but suddenly found themselves as part of a small but powerful elite group. They had completed the majority of the required initiatory degrees and discovered their religion was actually about something else entirely. And as it is in all such secretive clandestine groups, one knows too much to leave. Oaths had been taken along the way. They had gained much power and prestige. They were connected—part of a small cabal of high-end movers and shakers. The hidden agenda was about control over the masses for the benefit of the elite. Most people never make the connection or get the big idea, and are deceived by the pomp and ceremony. They are fooled by titles and degrees. They honor such people because they perceive them as far above themselves and very close to God. Their heads are in the heavens. They do their work on elevated stages. They wear special clothing that sets them apart. They have soaring resumes and rule over churches and ministry organizations. They possess a holier-than-thou arrogant and high-minded attitude. The higher they climb, the more their supporters increase and hang on every word spoken. They rarely climb down off their high horse and mix with the common people. They wear fake smiles and attitudes, talk a lot but say little, and refrain from teaching anything that may compromise their comfortable lifestyles. As classic Pharisees, they talk very good but do next to nothing. Once they build their ziggurat, nothing ever changes. They bask in the glory and support of the people, and become completely enamored of their own self. If they discover they have been compromised by demonic forces, it is too late to change. They cannot go back. They cannot stand the thought of losing their power and prestige. There are two principle spiritual movements going on in America at the moment. One regards the early beginnings of a national Great Awakening consisting of faceless nobody real believers with sincere hearts and absolute dedication to the Lord Jesus at all costs. The other is a fake movement made up of largely deceived masses unaware that they are being manipulated by elitists for alternative purposes. In ancient Sumer, the elites used any and all methods of control that existed. Such methods were mere tools in the hands of artisans. Through military conquest, political intrigue, and monetary power they gained absolute control. But religion was their greatest tool. It was mixed in with all the others and the people were none the wiser. Beware the mixing of Christianity with political economic interests. The Lord Jesus and His men were not Zealots, Scribes, Sadducees, or Pharisees. They did not attempt to rule politically or through military might. They were not in bed economically with the Romans. And they certainly did not try to rule through the medium of religion. Instead of a ziggurat, the Lord had no place to lay His head, preached in the streets, from boats, in the wild, and at the base of a great hillside, though it is now mistakenly referred to as the Sermon on the Mount. Later, His men were hounded everywhere they went. The only honor they received was from God. The world hated them. And as that world continued to preach progression toward the top of a mythical pyramid, it actually consistently regressed toward eventual destruction and hell. American Christians are at a fork in the road. We are either living stones being built up as a spiritual house and all-inclusive holy priesthood under the sole authority of the Lord Jesus, or we are burned man-made bricks comprising a fake Christian ziggurat held together by the tar of hypocrisy and religious control. There is no other alternative. Posted on July 26, 2011, in Current Events and tagged Christianity, Great Awakening, Hidden Agenda, Lord Jesus, One World Religion, Progressive, Real Christianity, Sumer, Tower of Babel, Ziggurat. Bookmark the permalink. 2 Comments. Pingback: Progression Regression: The World is Going to Hell (2) (via Real Christianity) | The Christian Gazette. "This is a must read article from RJ Dawson and Real Christianity!!!!"